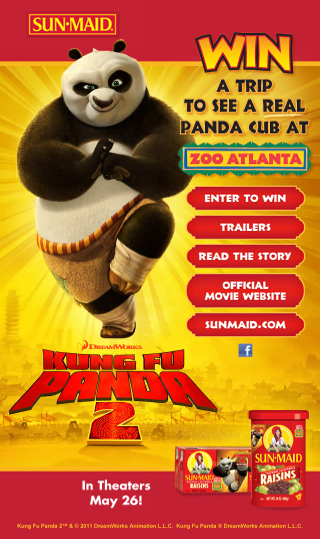 This week Sun-Maid Raisins launched a campaign contest promoting the Dreamworks film Kung Fu Panda 2. Sun-Maid raisin six-packs and 24 oz cannisters feature on-pack QR Codes that direct users to a mobile web destination where they can enter for a chance to win a grand-prize trip for four to Zoo Atlanta for an up-close and personal experience with a panda cub. When the QR code is scanned it takes the user to a mobile friendly landing page (pictured at right). So far, so good. Things get a little weird from there. When ‘Enter to Win’ is tapped, the user is taken to ‘sunmaidoffer.com‘, the main promotion site and one not optimized for mobile. The user is then required to click ‘Enter to Win’ a second time and then led to the entry form. Considering the fact that the campaign materials and press releases focus so heavily on the use of QR Codes, it’s unfortunate that the same attention was not given to providing a complete beginning-to-end experience optimized for the mobile user.